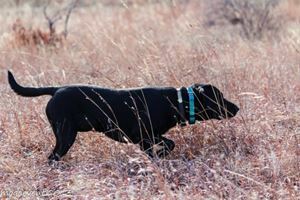 Scout was the 2012 National Pheasants forever/Quail Forever Amateur Flushing Champion as a two year old. Scout won the 2012 Kansas State Quail Championship in the Amateur Division as a 2 year old, Second in the 2011 Kansas State Quail Championship as 1 1/2 year old. 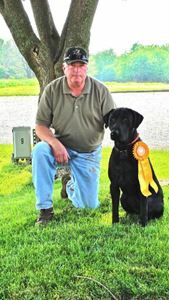 He Placed 5th in the National Upland Classic Series Browning Tournament of Champions (all 28 Open Dogs). 2nd place in High points for the year and is a Grand Amateur Champion in the National Upland Classic Series (N.U.C.S.). He is a Field Champion in Bird Hunters United (BHU) and in the National Bird Dog Circuit (NBDC) all within 14 months. He has his Junior Hunt Title in AKC, needs two more Senior passes for his SH Title and is a GMPR in the American Pointing Labradors Association. Scout is a very bird driven intense dog in the upland or the duck marsh. 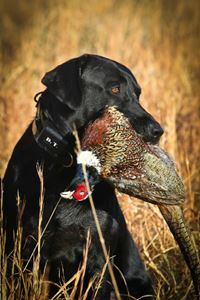 He will fly to the marks to retrieve and is a hard charging dog in the upland field with a rock solid point, style and has a excellent nose for birds. At home he has an off switch and is just a rock solid 85 lb. teddy bear. He loves kids and sleeps in the house when he is home.